This year the FFM will include Professor and philosopher Cornel West (Race Matters) lecturing before the show of hip hop artist Lupe Fiasco; Mako Fujimura (Refractions) will speak of the creative life, and there will be presentations on everything from culture making (Andy Crouch, of course, whose book Culture-Making we again commend to you) to spiritual themes in the blues (Central PA’s own Stephen J. Nicholes, author of the Brazos book we’ve promoted Getting the Blues) to workshops on what rock journalism and art criticism ought to be about. From the guys of Paste to splendid writers like Cathleen Falsani (Sin Boldly: A Field Guide to Grace and the forthcoming The Dude Abides), David Dark (Everyday Apocalypse, The Gospel According to America, and the new, provacative Sacred Art of Questioning Everything), Terry Mattingly (Pop Goes Religion), Charlie Peacock (At the Crossroads) and more. Heffner and Co. bring in some of the best folks in faith-based engagement with contemporary music. That over the years Calvin has hosted musicians as diverse as Sigur Ros and David Bazen, Niko Case, The Psalters, Sufjan Stevens, Emmy Lou Harris, Over the Rhine, T-Bone Burnett, The Blind Boys of Alabama, Bill Mallonee, Rosie Thomas, and Ben Harper shows the diversity of talent and the artists that may not typically play in such an evangelical setting. Wake us up, indeed. Thank God for Calvin’s witness in this area, for Ken’s colleagues like the folk who publish the great ezine catapult, (the new issue is called “Crying Out in Stereo” and is a must-read for music fans) or pop-culture scholar, William Romonowski (author of Eyes Wide Open: Finding God in Popular Culture.) I can’t tell you how that whole gang up there, and all they stand for, has inspired and supported us in our over the years. Well. One of the artists who for many of us pioneered this sort of important pop music integration of exceptional musical excellence, remarkable lyrical craft, thoughtful religious faith, and who, through lyrics, interviews, activism, and sheer longevity as a vital public performer, has made his nuanced faith-based art known and respected, even among the most secular of critics, is Canadian singer-song writer Bruce Cockburn. Although Mr. Cockburn is not appearing at the Calvin FFM this year, his new live album releases today, and it’s brilliance—as a new project capturing him solo, and as a bit of a career retrospective—-will surely be on the lips of some of the fans of the FFM project. 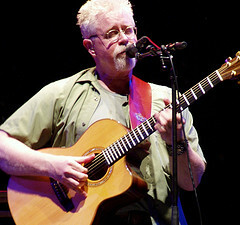 Cockburn, as you may know, was a rising star in the folk circuit in the late 60s and had achieved extraordinary respect by the 70s as a singer-songwriter and one of the best guitar players around. 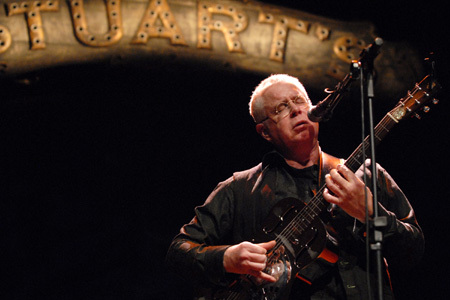 Other musicians envied his dexterity, his chops, his odd tunings and overall musical genius. When, through some mystical experiences and a thoughtful study of the novels of Charles Williams and C.S. Lewis and the like, he became a Christian, a whole new audience began to follow him. As he learned to tour with a band, gained exposure on the world scene, came to incorporate world beat, jazz and other urban rhythms and unusual musical forms, he (like Dylan going electric) lost a few folkie purists, but picked up an even larger global audience. Here is one reviewer’s excellent overview of his journey and large body of work. The Cockburn Project is an excellent internet site keeping track of his work. co-authored 2008 Eerdmans book Beyond Homelessness: Chrisitian Faith in a Culture of Displacement, he drew inspiration from these urgent themes in Cockburn’s work; see Walsh’s wonderful essay At home in the Darkness, but Hungry for Dawn: Homecoming in Canadian Songwriter Bruce Cockburn We highl, highly recommend them both. We have carried Cockburn’s albums from the beginning—the first I bought was in the mid-70s, In The Falling Dark, and I still have the LP with Ken Heffner’s notes scribbled on it, from when he borrowed it. We agree with Walsh that BCs work is a rare example of exceptionally insightful contemporary music, and we celebrate the release of the new one today. 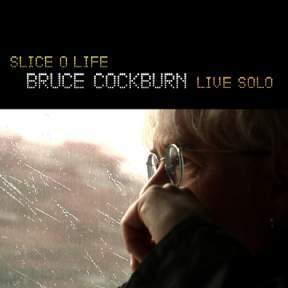 Slice O Life is a double disc, recorded live from his recent solo tour. Cockburn has a few other great live albums yet they feature blazing electric guitar, groovy band vibes, Afro-rock/world beat Reggae stuff, alongside his more typical soft-rock tunes, accompanied, always, with top-shelf fellow musicians. Those that follow Bruce, though, have long hoped for a solo, all-acoustic record of his live shows that shows off what he can do with these big songs when it is just him, unplugged and on stage, dazzling, by himself. Slice O is a slice of his own touring life, with a few interesting stories between the songs, some new arrangements of Cockburn classics, a couple of sing-alongs (yes, he does Wondering Where the Lions Are) and some few great photos in the package. The second disc features fascinating recordings of jamming around during the sound-check, including some extended blues stuff…) You can see the song titles and read an excellent overview of the project (and may still be able to hear it for free) at the True North website here. We could be delighted if you bought it from us. It is, as I’ve said, a great illustration of much of what we are about here: waking people up, using the arts to make us think, attending to how faith fuels imagination, and how the popular arts can take us places, teach us things, inspire us to see and act in new ways, and, of course, entertain us. Wide awake. pumped about this disc. I’m a new Cockburn fan and bought his greatest hits at your store recently.